At the beginning of December, the Association of Young Wine Makers, Junibor welcomed a new member to its ranks. László Babicz was selected at the AGM, the first member from the Mátra wine region, the largest of Hungary’s historic wine regions. László inherited his vines from his grandparents and has been involved with winemaking since his school days. He was able to take this to a professional level with the support of his parents and grandparents. Tamás Hernyák, president of the association, points out that ‘Junibor is a community, so they try to select new members who will take part in joint programmes and activities and help to build the community’. His wines will soon find themselves on the shelves of DiVino, the chain of winebars with which Junibor works in close cooperation, taking part in its everyday life, for example with evening events where they welcome guests and offer them the opportunity to taste barrel samples and wines which are only available at the cellar door. On 16 November, Junibor members presented their new wines to guests at the DiVino Gozsdu wine bar in Budapest. Junibor, the Hungarian Association of Young Winemakers, was formed in 2008 to bring together young winemakers and create a community helping to provide professional development for the next generation of winemakers. Junibor members have to be talented young winemakers aged under 35 when they are chosen and can only remain in the association until they are 40. They are very often the offspring of another generation of prominent winemakers. They currently have around 30 members from 11 wine regions in Hungary. Its history has been intertwined with the DiVino chain of winebars, the first one opening facing St Stephen’s Basilica in 2011, with the aim of offering only Hungarian wines, including the best wines of the Junibor members. The chain has grown over the last five years, with new locations opening in Győr and the Gozsdu Udvár in Budapest, which offers 120 wines by the glass, and was where the tasting was held. Zsolt Gere from Villány showed an attractive youthful Muscat Ottonel using bought-in grapes and his Marton Napi Újbor, a Portugieser. The Portugieser was not a light wine, like usual, but a thicker wine with more tannins, yet elegant and playful. The bunches had been big with large grapes and there had been a couple of shrivelled grapes in each bunch. It saw no oak, went through malo and was then bottled, bright, fruity and fresh. He admitted that it had been a difficult year, with spring frost, and they had been happy to save the grapes. Their Cab Franc, Sauvignon and Merlot should be capable of producing premium wines, whereas the others will probably fall into the good category. Peti Frittmann from Kunság brought along an aromatic Irsai Oliver, which was light and balanced and a Neró rosé. The grapes for this had been harvested early and resulted in a very floral rosé with plenty of red fruit and rose. Peti said that the cool year had contributed to the intensity of the aromas and the retention of acidity. He also produced a rosé blend from Medina and Zweigelt, which was fresh, crisp and fruity. The reds that they were able to harvest later were good too, he said, also maintaining a good level of acidity. Tomi Kovács from Szent Donat in Csopak had a pair of vineyard-selected wines. A Kódex Olaszrizling from the Slikker vineyard, fermented partly in oak and partly in stainless steel, very attractive fresh wine with good acidity, lingering minerality and almond notes on the finish. The other wine was a Furmint from the Márga vineyard, partly aged in pyrogranite bowls, which he tells me, are a little like concrete eggs, allowing the wine to breathe, thus micro-oxidise, as if it were in oak but imparting no influence and so allowing the grape and terroir to shine through. Certainly the Furmint demonstrated excellent varietal purity and lovely minerality from the Márga soils. He said that they had experienced a lot of hail and had not even been able to harvest anything in some vineyards, although they had managed to save about 30-40% in Slikker. The harvest took place three weeks later than usual, and the quality was excellent where there had not been any hail. Flóra Jekl from Villány poured a Primo rosé made from Kadarka, Pinot Noir and Syrah. Fresh and fruity, a bit tutti frutti with a touch of spice. She told me that she would also make a gyöngyöző (lightly sparkling) wine from this. Her Portugieser was light and fruity with fresh acidity. Tomi Kis from Somló brought along a Somlói Juhfark from the Gróf vineyard, an attractive nutty wine with plenty of yellow fruit and minerality. Tomi reported that they had suffered more than 60% damage due to hail, and the result will be a small quantity of good wines. To make matters worse, they waited until the last minute to harvest, and then the birds came! Ákos Kamocsay presented wines from the Mór wine region. A Rhine Riesling, still cloudy and young, that will be bottled next year, so very much a sample. The Chardonnay, also a sample, is being aged in 500l used oak and will spend 8-12 months in barrel on its lees and then go into stainless steel. Quite smoky and toasty with plenty of fruit along with zippy acidity and perhaps a touch of tannins. He said that Mór had also experienced a mixed year, afflicted by both frost and hail, but those who had not suffered damage had harvested good, healthy grapes. As usual, Csabi Miklós was surrounded by a gaggle of admirers, so it was rather difficult to exchange any words with him, but he conjured up a barrel sample of his Demi Moor Királyleányka, which with lovely peach fruit and a touch of residual sugar, he said was intended to be a gastro and festival wine. His Ezerjó, the key wine of the Mór region, was fresh, lemony and appley with a touch of residual sugar and some saltiness on the finish. Dóri Bussay from the Zala region had a barrel sample of her Pinot Noir, still displaying some yeasty notes. The aim here, she says, is to have a fresh, fruity wine, so it will move barrels frequently. They were lucky and only had about four vines affected by frost as they are on a plain rather than in a valley, and the hail there came with rain, thus not much loss. The wine exhibited nice cherry fruit, was quite full bodied, with smooth tannins. It will have 8-10 months in oak and 2 months in bottle before release next August. Csaba Vesztergombi had a Királyleányka, bottled that day, attractive and balanced, with plenty of stone fruit, very drinkable. He also showed a Pinot Noir rosé, gaining its colour simply from being pressed. Fresh, attractive fruit, elegant, bright and very quaffable. Tomi Hérnyak from Etyek brought along a Sauvignon Blanc, which generally does well in Etyek due to its cooler climate, and displayed lovely varietal character, although still a bit yeasty. Tomi says that they can make good varietals and aromatic whites this year in Etyek. The autumn was hot and sunny, which was a saving grace after the earlier part of the year. He also had a late-harvested Zöldveltini, which had lovely citrus flavours of lime and lemon and some green peppercorns. Balanced, spicy and with good acidity. Bence Dúzsi from Szekszárd had a rosé from Blauburger, Portugieser and Zweigelt. Pale, attractive fruit, restrained on nose, but more intense on palate. Fresh and very quaffable, with perhaps a spritz of CO2. The red estate wine (Birtokbor) of 50% Kékfrankos, Cab Franc, Sauvignon, Merlot and some Pinot Noir aimed to show the winery’s characteristic varieties, and was rich and fruity with a hint of toasty oak. Andi Gere from Villány had DiVino branded Irsai Oliver, light, summery and aromatically fragrant, and a rosé from Kékfrankos, Merlot, Portugieser and Pinot Noir, restrained and elegant, but with enough bright fruit to balance the fresh acidity. She also had a barrel sample of Portugieser, which will spend a further three months in oak. Attractive fruit and some toast and coffee, but with just a touch of bitterness and slightly flabby acidity. Angelika Árvay of Tokaj had a Sauvignon Blanc which had only been harvested on 26 September. The grapes were bought-in, but they did the harvest themselves. It has only seen stainless steel and will hopefully be bottled in January or February. Attractive varietal character and lovely fresh acidity. A tank sample of Sárga Muskotály was the last wine. It needed lots of aeration as it was very yeasty, but some lovely grapey aromas shone through, with a touch of salt and some residual sugar. The crowds were now building up, so it was time to head off, but all in all an impressive collection of still very young wines. 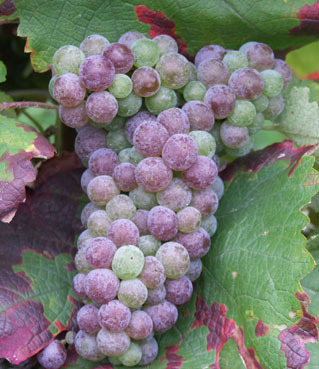 A dark-skinned grape variety (known in the US as Agria), with deeply pigmented flesh, most commonly used to enhance colour in blends. It forms an important part of Egri Bikavér. However, I had the chance to try this as a varietal from Szeczkő pince. Luscious dark berries, perfumed mouth-filling flavours, beautiful dark violet in the glass. Only 445 bottles were produced, so sadly I don’t think I’ll be able to get my hands on another bottle.